We all have been living in the world of great advancement yet there are some things that we have no control over. We absolutely hate to be in interaction with someone with two faces, a split personality, but that might not be the case if we tell you a rare phenomenon. 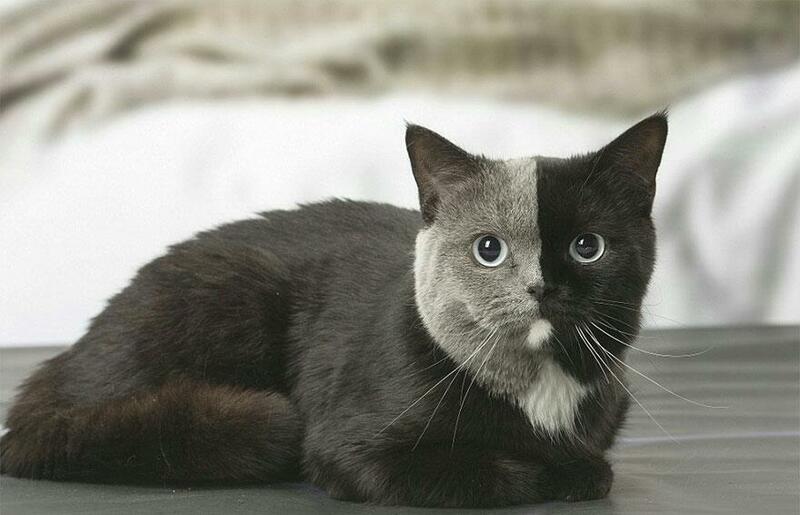 There is a kitten, which was born with two faces not exactly two faces but with a two-toned fur which is completely adorable, whose pictures were clicked by an animal professional photographer, Jean-Michel Labat. These photos have created headlines about this cat. This cat is a British Shorthair breed and lives in France. The photographer has done an amazing job by highlighting all the best tone changes on the face and the body, which began when the kitten was in its mother’s womb. The name of the cat is Narnia and she was born on March 28, 2017. She had her breeder, Stephanie Jimenez who instantly fell in love with the blue diamond like the ambiance of her eyes. Well, the reason for this unique appearance is unknown in her case but in the cases of other cats, they are called chimeras. Feline Chimeras are such cats whose cells contain two different kinds of DNA, because of fusion of two embryos with each other. So here we have the kitten with two faces that grew up and became the most beautiful cat you’ve ever seen! With closed eyes, the cuteness is too much. Check out the blue hue we were talking about. Don’t you think that this kitten would fit into our hands? The body and this face of this rare cat are totally phenomenal. She happens to be a proud owner of this beautiful cat. The black and grey fur is its adjective. Unlike others, this one seems fun loving. Look at those peeking eyes. We wish we could own this cat. Look at it, drilling its expressions. Finding a cat like this is extremely rare in today’s world because it is a result of very complex genetic recombination and it’s absolutely amazing. This cat is an epitome of such amazing biological phenomenon, and the owner is really proud to have a cat that looks so beautiful. We all wish we could have a cat like this, but maybe we are not that lucky. 12 Creative Ideas Discovered To Protect Your Christmas Trees From Your Pets.